Los Angeles is never short on new tantalizing food options. Chefs bring their culture and their own travel inspiration to the food game often blending cuisines and exciting taste buds. Try one of these festive dining options for singles, couples, or groups of friends. Share a meal, and elevate your senses with a new culinary experience. Think Israel, Turkey or eastern Mediterranean cuisine. SHUK has popped up in Santa Monica on Main Street next to Jinya Ramen thanks to Chef Gregg Drusinsky and Chef Sandy Ho. Chef Gregg Drusinsky’s mom passed away while she was living in Israel which sent him back to the country from his fine dining cooking in NYC. Inspired by the open air markets in Jerusalem, Drusinksy’s menu reflects his passion and inspiration for a simple way of cooking and eating communally. Shuk or souk means marketplace. 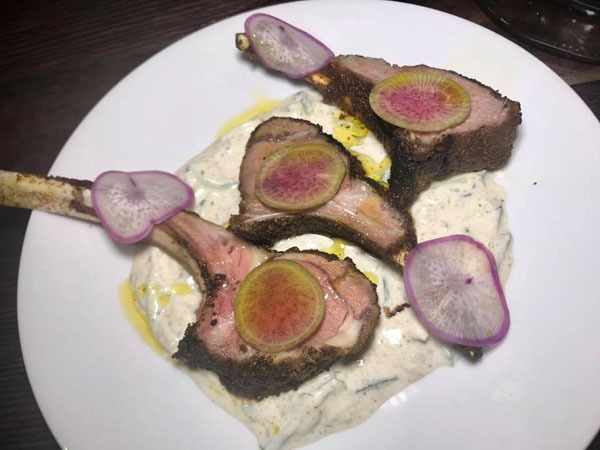 Expect an array of classic dishes using fresh local ingredients like lamb shawarma, local squid, smoked mussels, brisket tagine with wood fired laffa bread, falafel-stuffed charcoal pita, charred eggplant with tahini, and hummus and cauliflower. Dishes like turkey figs with labneh and crispy rice with flame raisins and pistachios are still on my mind. Dinner concluded with sweets like halva made from tahini that tasted like a rich fluffy nutty peanut butter with wavers, which paired nicely with ice cream from Van Leeuwen. 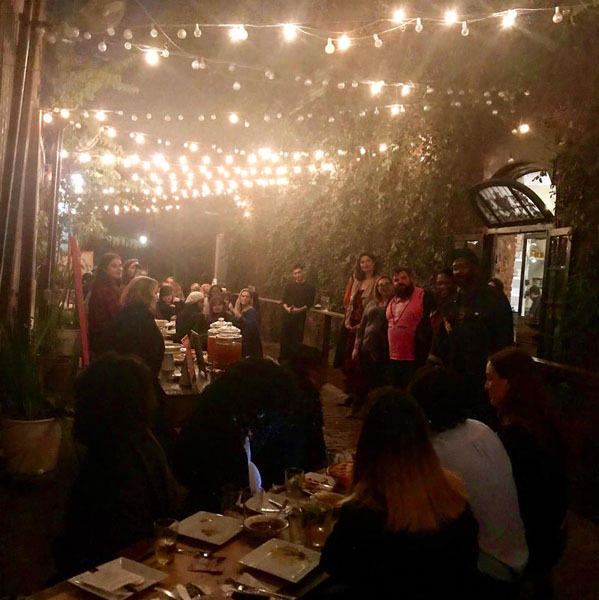 I found myself in downtown LA on a Friday night dining outside seated in a tightly packed communal table under a vine covered twinkle lit patio for “Friendsgiving” with people I didn’t know, and it was a blast! Fall cocktails were flowing thanks to LA’s Greenbar Distillery and before arrival I chose the table I wanted to sit at by looking at the seven special co-hosts for the evening. Of course I picked Jeff Miller, who has a show on the Travel Channel and was the founding LA co-editor of Thrillest. The shared dinner with about 70 guests included turkey tacos, Mexican street corn, and more shared passed bites. Sampling dishes and sharing laughs and pie bites with our tablemates for the evening’s pie contest was a fun bonding exercise. Reserve your seats for their next dinner on the Kitchen Table App. Browse events in your area for time and place, and what the meal will cost and the App will show you how many seats are available at each table. Not only can you eat local, but meet new friends over a shared memorable experience. Now til February 2018, Kitchen Table App is offering 5 complimentary tickets to a fan and their guests. Email vip@kitchentableapp.com and state you read it here. Japanese Mexican fusion, anyone? 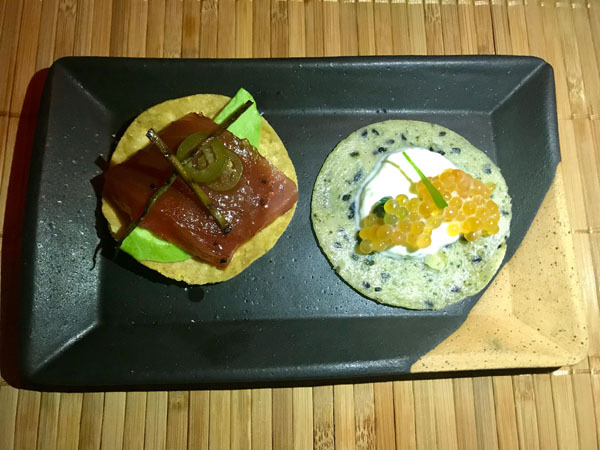 The 10+ course exploratory tasting menu at the back omakase bar is tucked in the corner of h.wood Groups’s new chic West Hollywood establishment Petite Taqueria. 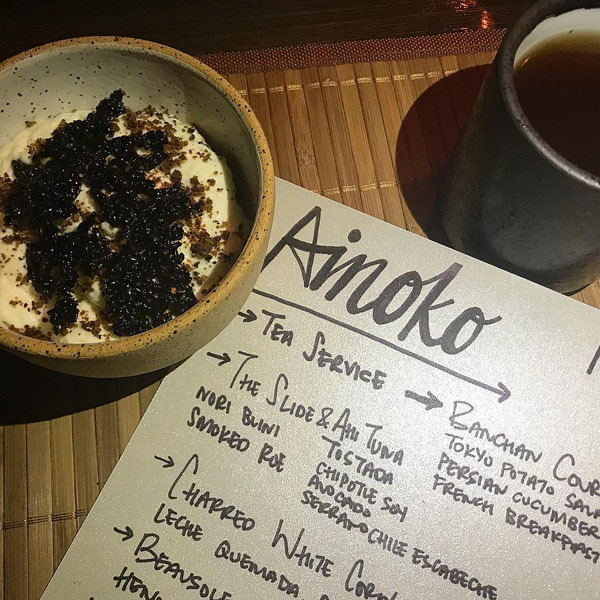 The omakase bar called Ainoko means half-breed or fusion. Each thoughtful bite is created by Chef John-Carlos Kuramoto, an LA born Japanese Mexican who seems to have been waiting for the right time in his chef career to build this labor of love. A tea service begins the meal and continues throughout. 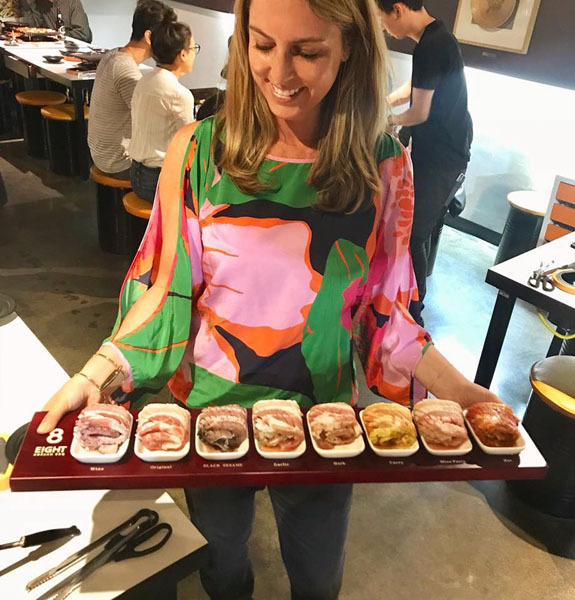 Highlights of these carefully crafted courses include charred white corn soup and a multitude of little taco bites including a cook your own wagyu taco, an ahi tuna tostada, a grilled octopus Tako Taco, and Banh Mi Torta with duck confit and chicken pate. Other memorable courses include hot oil hamachi and a Beausoleil oyster with Hennessy Mignonette. Different flavors, ingredients, and techniques are embraced to create something new. You’ll be wondering all night if the course includes Japanese preparation and Mexican ingredients or the other way around. 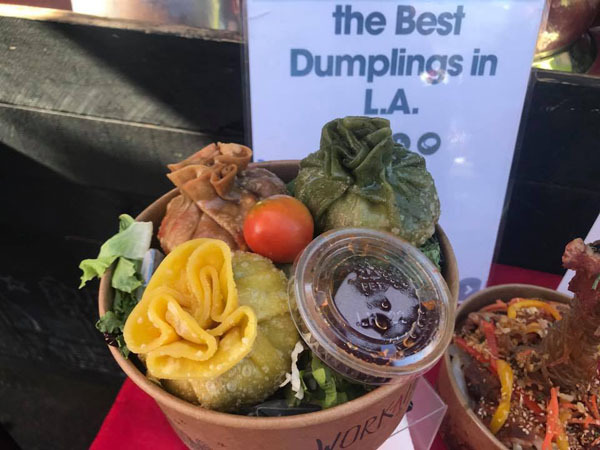 The open air market that started in Brooklyn is now in downtown LA every Sunday from 10:00 – 4:00 with over 65 vendors perfect for families or friends that want to share exciting new food concoctions from all over the world. 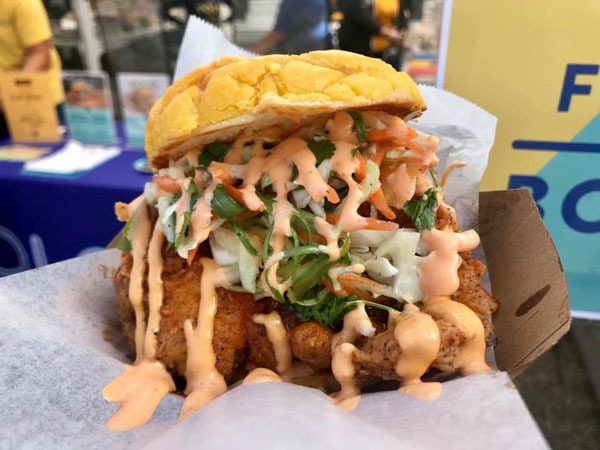 Don’t miss BOLO which takes the traditional Hong Kong favorite pineapple bun and stuffs it with Jidori Fried Chicken or even different ice cream flavors! BOLO is the FIRST concept of it’s kind to hit the US and Los Angeles! Sometimes vendors pop up one time only, like George Motz’s juicy sweet onion burger. Our first Smorgasburg appetizer brought us back to Thailand as we wolfed down a mango sticky rice from the hip truck at Sticky Rice. Brothecary served up a giant bone broth soup dumpling with a mini straw, and a 6 year old had to show me how to eat it. Lobsterdamus offers tempting grilled lobster, lobster Mac and cheese, lobster nachos, and lobster fries. The sign for New Haven Style Pizza caused me to yelp since us east coasters find it hard to come by legit thin, crisp wood fired oven pizza, just the way the Italians in Connecticut make it! Find White Clam and Bacon, So Meaty, Italian Sausage, Heavy Vegetable, and Margherita from $12-$15. Smorgasburg LA occurs on the five-acre site of the weekday Alameda Produce Market in Downtown Los Angeles, which is part of a larger new development called ROW DTLA. Besides food vendors, browse unique shopping from clothing, jewelry, health, craft, vintage, and more. A new parking garage nearby holds more than 4,000 cars with free parking for 2 hours. Children are welcome, but pets are not allowed. 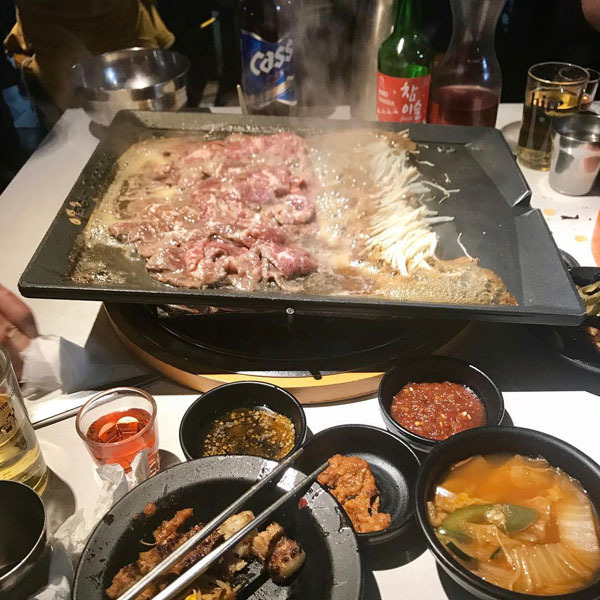 For a pleasurable night out, watch your dinner prepared in front of you in Koreatown, where the largest Korean population resides outside of Korea. The restaurant was packed when I arrived around 7:30 pm. My friends already seated around a table of specialized cookware from Korea instructed me to open my circular seat stool and put my purse inside. No need to get it dirty on the floor! Under the tabletop, my friends opened a drawer filled with utensils and napkin options. Aprons were brought out to help keep the sizzling meat juices from landing all over us. The Mangalitza pork belly marinated for hours in 8 different flavors is a must, thus the name. Our server was super attentive and cooked everything for us table side, making sure to check the temperatures, cut our meats and bring us more soju and beer. To start our interactive meal, we dropped pomegranate soju in a shot glass right into our beer and guzzled it back. Somehow after this enormous meat sampling, we found room to devour the bulgogi or “fire meat” cooked with red peppers and enoki mushrooms. I enjoyed the bulgogi even more, with enough flavor and marinade that no sauces were needed. Towards the end of our meal, a spicy kimchi fried rice was concocted right at the table with drippings that slowly poured from the meats from the specially designed Korean cookware. The juices dripped right into the soup pot and was topped with cheese. If you aren’t a pork fan, 8 Korean BBQ also has an array of Argentinian grass fed beef, USDA Prime, and Japanese Wagyu beef! Two locations can be found in Southern California, in Koreatown (LA) and Buena Park. This beautiful upscale dining room at 2420 Pico in Santa Monica made me feel warm and holiday-ish with dim lighting, a well dressed crowd, and fireplaces aglow. As we entered via the back, we passed through a romantic lounge, a sort of pre or post-dinner cocktail area with wooded bar, plush chairs, and brass-topped cafe tables. Chef Raphael Lunetta (formerly of Jiraffe) features New American eats that scream “fresh from the Farmer’s Market,” and are plated in such beautiful ways. A countertop invited our group to sample an array of dishes and watch the chefs at work. 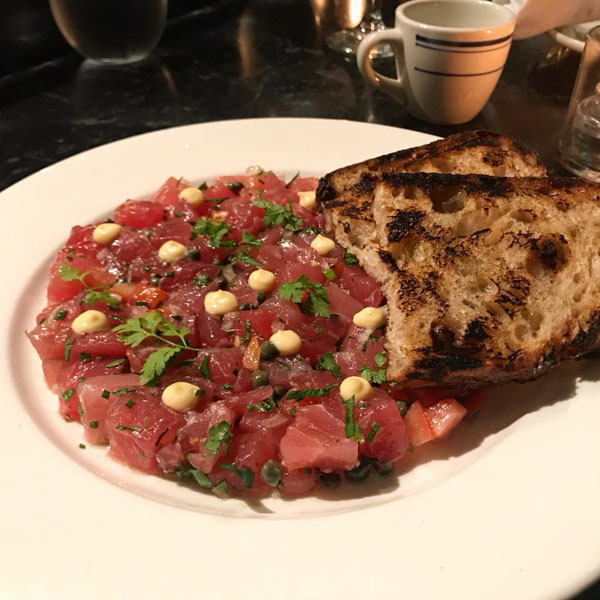 Highlights included a generous portion of Ahi Tuna Tartare that tasted like it had just been caught, Pear Salad with a nice pairing of toasted bread smothered with a sharp Blue cheese, Duck Confit with kumquat, and colorful Roasted Market Vegetables assorted artfully. Lunetta All Day is an all-day diner next door with reasonably priced bistro food (pastries, coffee, salads, sandwiches, main dishes, eggs all day). An outdoor area exists in the back that is elegantly crafted in a small space with wood benches and striped cushions, perfect for brunch. The metered parking was free outside after 6 pm, but large free parking exists in the rear too. This multicultural exchange sits in a nondescript shopping plaza in Marina del Rey. Enjoy weekend brunch served until 4 pm with Eastern European flair. Start with the Crunchy Bavarian Garlic Bread, a dark seeded bread stacked like jenga that comes with a garlic, yogurt, and horseradish dip. 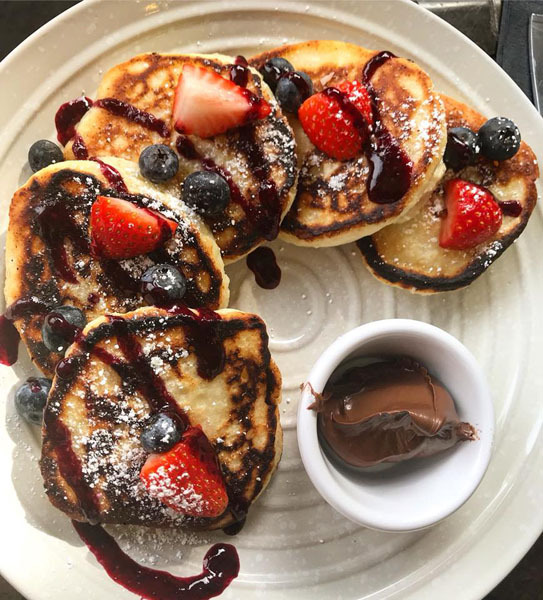 Share the ricotta pancakes dripped in chocolate. Leave room for the Brighton Beach Benedict, a hearty breakfast sandwich with chicken sausage, egg omelet, bacon, smoked gouda, arugula, tomato, garlic aioli on a perfect brioche bun, and fuel your morning with poached eggs and smoked salmon over latkes. A French press for two is $7 and their iced coffee in a large mason jar is sinfully perfecto. Explore options like the Doma Lamb Burger, Smoked Salmon Tartine, Hot “Borsch” Beets and Cabbage Soup (Ukrainian style soup), and Siberian house-made stuffed dumplings in soup. For the health conscious, make your own bowl with Eastern European slow braised buckwheat with various protein options. 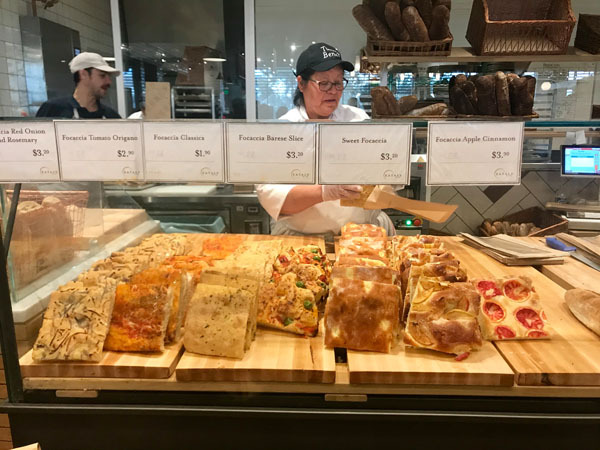 In the newly revamped outdoor Century City Mall, two story Eataly boasts a one stop shop for in-house freshly made, and locally sourced food products. 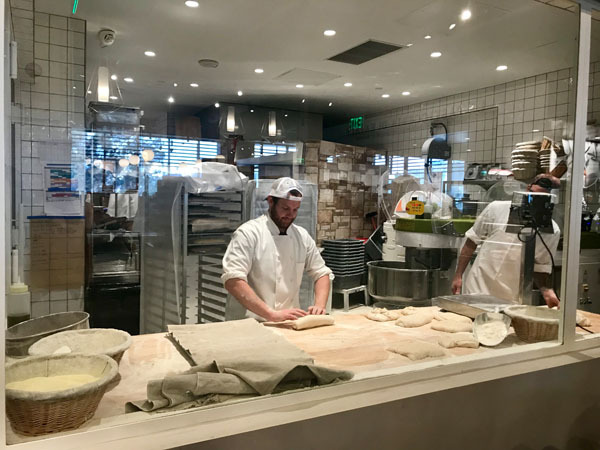 Eataly is still so hot in LA right now since its recent opening you need to prepare for the crowds, but it is a wonderful place to pop in to watch the food work in progress (as the counters provide no doubts for what is going in your food). Peruse the specialty Italian items for sale, grab a quick take-home White Moustache yogurt, sample a panini sandwich from the panini station or indulge on a thick but airy Roman style pizza served on a board. End your Italian dreams with a specialty dessert from Venchi, by way of Torino, Italy. The bakery makes everything from scratch, and you can expect nothing less from the Italians but to use 80 year old yeast creating easily digestible organic flour touted as gluten friendly. The salad, grain bowl, and juice bar has partnered with Chef Jason Neroni of Rose Cafe and will rotate every three months with a new chef. 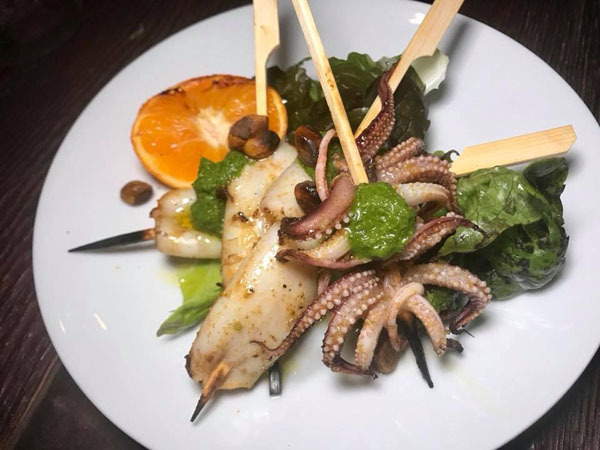 The Dock and Dish offers the freshest catch daily, and the sit down seafood restaurant Il Pesce has partnered with Michael Cimarusti from the famed LA restaurant Providence. 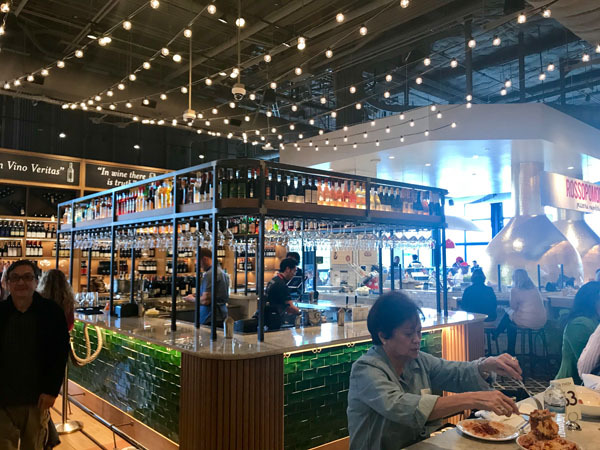 LA’s Eataly is the first wine shop to also include California wines. The cheese counter boasts over 300 local and imported cheeses which can’t be missed due to the smell and the olive oil station allows you to pour your choice of olive oil from a vat into a glass bottle that can be brought back and refilled. At the back of the market is La Piazza where you can find “Italian tacos” from Tuscany cooked on terra cotta plates and stuffed with different charcuterie and cheese, or sweets. 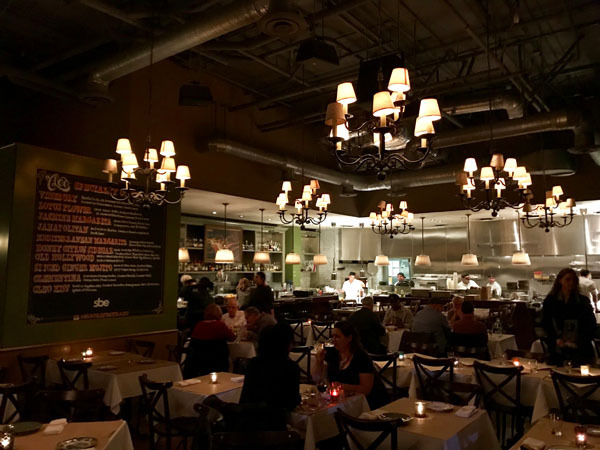 The area also includes a mozzarella station, lasagna station, polpette (meatballs) station, fritto station (fried items) and salumi and cheese. Seating looked easier to come by here. At the restaurant in the back to the left called La Pizza & La Pasta, the Neapolitan pizzas with stretchy soft dough are cooked in 90 seconds in the gold cone shaped wood burning ovens flown in from Italy. 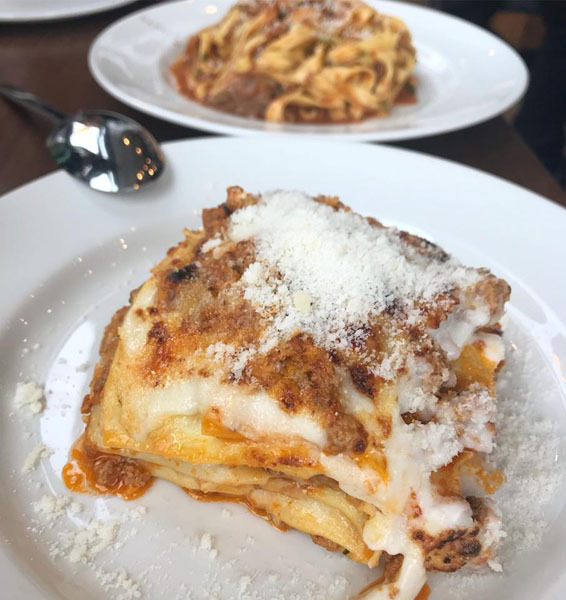 Unfortunately, no reservations are possible, but just make sure to order everything – mozzarella, pizzas, and homemade pastas so you can take home some leftovers. While trying to find my way out around the crowds at 1 pm on a Wednesday, I passed a lavish coffee bar and took the elevator downstairs to be wowed by a homemade gelato bar and their very own cooking school. Eataly is gourmet food stall bliss. There is a reason Cleo (SBE Group) in Hollywood with its Mediterranean fare has lasted 7 years at the Redbury Hotel. Now Cleo Mediterraneano can be found on W. 3rd Street too. Cleo brought me back to Morocco, Israel, and Greece, thus why this place is categorized as Mediterranean food. Cleo is perfect place to share numerous small dishes called Mezzes, like Lebaneh dip with Feta that arrives with a luscious warm well seasoned bread in a brown bag, Spanakopita with spinach and feta, and chicken, beef, and lamb kebobs. Brussels Sprouts seem to be on every LA menu, but the waitress indicated this is where the veggies got their start in LA. The once dreaded sprouts are definitely the best Brussels Sprouts we have ever tasted with toasted almost shaved-like sprout flakes seasoned with capers, parsley, almonds, and vinaigrette. 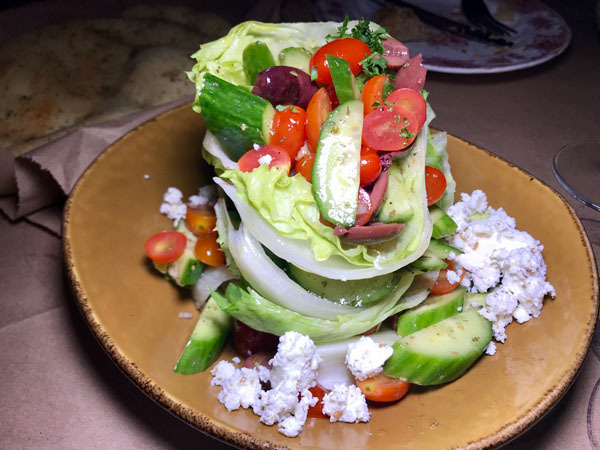 The fresh Greek Salad is a must, concocted with jigsaw placed tomatoes, olives, feta, and cucumbers. Numerous tagines are on the menu, like Moroccan Vegetable, Meatball, Lamb, and Chicken. 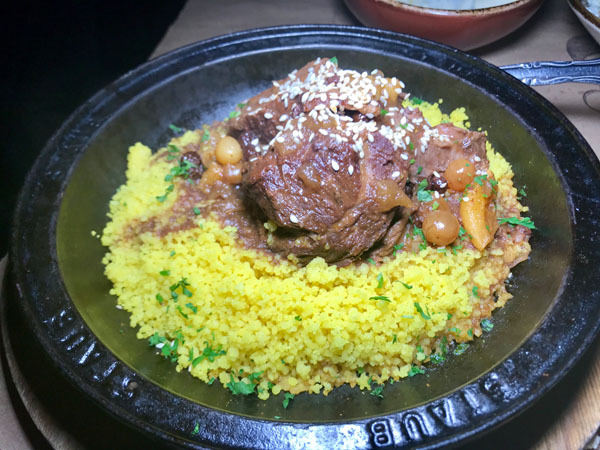 The Lamb Tagine is exceptional with succulently seasoned lamb on a bed of couscous mixed with apricots, grapes, silan (date honey), and sesame seeds. Flatbreads, Branzino, Grilled Shrimp or Octopus, Moroccon Fried Chicken, Lamb Shawarma and Moussakah are also available for dinner. Although this place might seem a bit trendy Hollywood, the food is impressive, and the cocktails exceeded our expectations. At first glance, the drinks may look too fruity, but they are delicious! The Vineberry has a nice spicy kick with Serrano, vodka, elderflower, crushed basil, lemon, and cucumber. The Janapolitan was just as tasty with vodka, lime, crushed strawberries and basil leaves. Cleo is a short walk from the Pentages Theater. The upstairs former bar and outdoor area is being renovated, and we heard may become the Hospital Club, the private members club that originated in London for people in the creative industries.